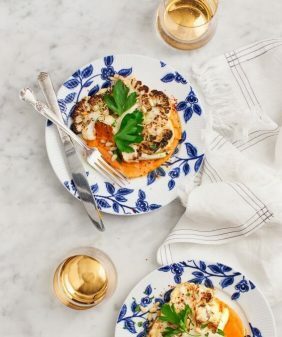 When I'm craving an easy, cozy weeknight dinner, I make this cauliflower puree. I sprinkle it with capers, roasted chickpeas & fresh rosemary. This cauliflower puree might just be my last cauliflower post of the season. I’m trying to remind myself that it’s still March and many of you have snow on the ground. Or at least slush. Which is hard for me to comprehend because it suddenly became July here this week. But last week, when it was a little bit cooler and cauliflower was still showing up at my door, we made this fancy little meal. Cauliflower, two ways… a light velvety puree, with roasted florets and chickpeas on top. 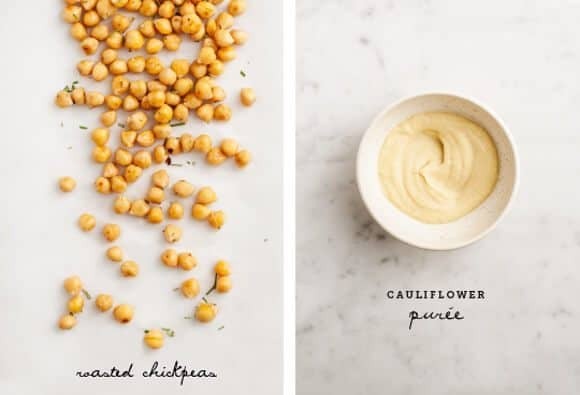 Give this simple, healthy cauliflower puree an elevated feel by topping it with roasted chickpeas and cauliflower florets! Vegan and gluten-free. Meanwhile, bring a large pot of salted water to boil, boil 3 cups of the cauliflower florets until tender, about 10-20 minutes. While the cauliflower is boiling, start roasting the rest of the cauliflower and the chickpeas. Prep 2 baking sheets with foil. Separately toss the chickpeas and cauliflower with olive oil, garlic, rosemary, salt & pepper. (I do this right on the baking sheet). Roast both in the oven until golden brown, about 25-35 minutes, checking halfway through. Make the cauliflower puree: Drain the boiled cauliflower, and transfer to a high speed blender. Add the garlic, butter, ½ cup chickpeas, rosemary, lemon juice, salt, and pepper, and blend to form a smooth puree. Taste and adjust, adding more salt, pepper, and/or lemon as necessary. If yours is too thick, add some water or milk. If it's too thin, add some more chickpeas. The consistency should be thinner and lighter than hummus. (*note that I used a Vitamix. If you're using a regular blender yours might not be as smooth). 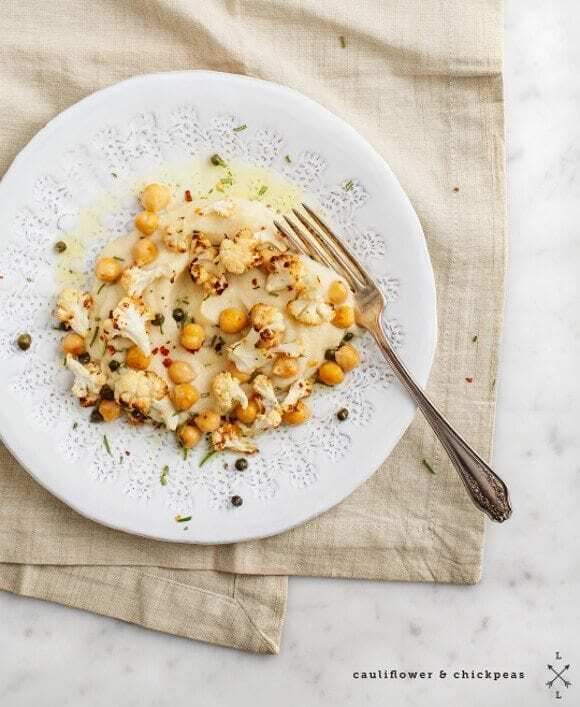 Plate with a generous scoop of the puree and top it with the roasted cauliflower, chickpeas, a drizzle of olive oil, capers, a few small pinches of red pepper flakes, and another pinch of rosemary. And an extra squeeze of lemon if necessary. You can make the cauliflower puree up to one day in advance. The texture might change overnight in the fridge, and you might want to blend it again just before serving. Roasted chickpeas have been one of my favourite things this winter. Love this super dreamy pairing. Jealous of your July-esque conditions, lady. You sure know how to make cauliflower puree look elegant! Definitely will be trying it soon with rosemary + roasted chickpeas. This looks so lovely and delicate. I’ve never thought of pureeing cauliflower and I am not sure why not. It sounds like a wonderful idea. I’ve seen pureed cauliflower everywhere lately, but haven’t tried it. 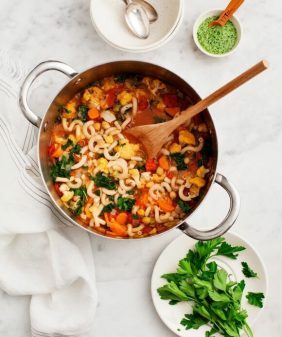 This recipe looks great and is officially added to my to-do list! I love how you get so creative with cauliflower!! Yum! Such a lovely pairing. It also looks very elegant. Can’t wait to try this! Your photography is divine! I’m in love. Love this! I absolutely love cauliflower and roasted chickpeas. Beautiful photos. Oh my gosh this looks heavenly. I will absolutely be making this VERY soon. This is so beautiful! I am definitely going to have to try this before we can’t get cauliflower here anymore. I love this dish! What a fantastic idea. So many wonderful flavours and textures. 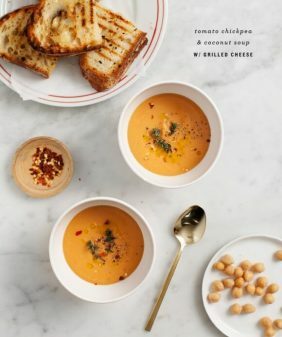 I have some chickpeas and some cauliflower in the house – so I think I better give this a try this weekend. 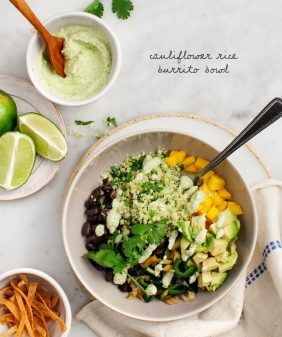 This sounds delicious – definitely making this soon! Lovely! I cooked an enormous batch of chickpeas this weekend and I’m slowly gathering new recipes to mix in with the old standbys. Yum! Just made the purée for dinner tonight. It is absolutely dreamy. Can’t wait to finish it off with the chickpeas, roasted cauliflower, and some braised tempeh. I believe I’ve eaten my weight in roasted cauliflower this winter, deeply enamored of it as is, burnished and perfect. But paired with my all-time favorite addictive snack, I wish that this dream combination had arrived far earlier than mid-March. Still, we’ve got some Winter left in Minnesota. This looks so very delicious. 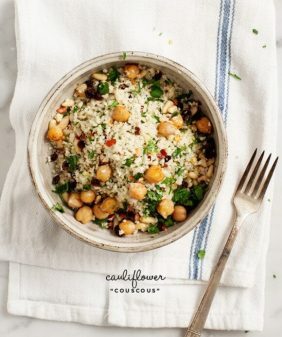 Cauliflower and chickpeas, I’ve never thought of putting the two together. Have to try it. Compliments on a beautiful blog! It must taste delicate and amazing. I can almost imagine it. That sounds fantastic… I love mixing cauliflower and broccoli (like 2/3 cauliflower 1/3 broccoli). Do you think it would work with this recipe? I love cauliflower! This is beautiful, cant wait to make and taste. Lovely blog. 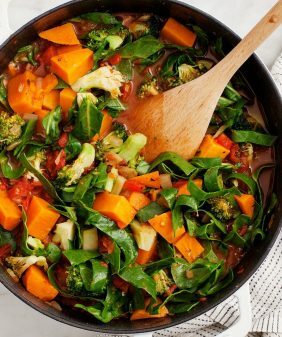 Your photography is always stunning and this recipe is delicious – it has become a frequent rotation in my house (Winter here in Aus atm). Dad passed on a beautiful cauliflower from his garden and there was no better use for it then this recipe! You are a star! Just made this. Heaven! I couldn’t wait to eat it, I got my tongue burnt. Still delicious! This morning I was searching for new ideas for cauliflower, and chanced upon your site…and this recipe. I was going to make it for dinner but couldn’t wait and I’m currently nom-nom-nomming on it now! What a yummy recipe! I wish I could post the photo of what is the prettiest dish I’ve ever made. I added in some edamame beans too. I’ll be making this regularly! I’m so glad you liked it! Ha, so funny that you couldn’t wait until dinner :). So so yummy – my 7-year old completely approves. I didn’t have enough chickpeas so I substituted cannellini beans in the puree and saved the roasted chickpeas as a topper. Perfect!